The video shows an extraordinarily athletic Canadian kid doing amazing things with a basketball. Like dunking on a kid. Then dunking on another kid. Aaaaand dunking on another kid. Sure, there’s the occasional baby hook, the occasional ankle-breaking crossover, but mostly, the 40-second mixtape is a dunktape. It has been viewed 4.7 million times. Another mixtape, one that’s three minutes long, is from Wiggins’ time at Huntington Prep basketball factory. This YouTube video calls him the best player in high school. It also features mostly dunks. It has been viewed 4.1 million times. 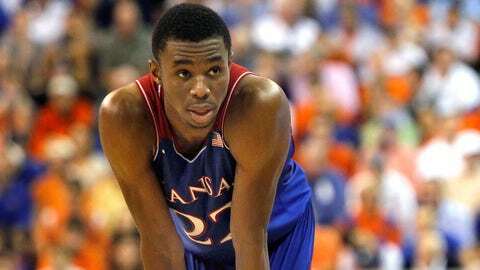 I bring this up now, halfway through Wiggins’ freshman (and presumed only) season at Kansas, because the number of voices criticizing Wiggins for underachieving compared to the enormous (and utterly unfair) expectations has shifted from underground rumblings to an out-and-out narrative of his season. Conventional wisdom among NBA draftniks is that Wiggins has shifted from surefire No. 1 pick to now sitting behind his teammate, freshman 7-footer Joel Embiid, and perhaps Duke’s hyped freshman phenom, Jabari Parker. One article I recently read wondered if Wiggins could fall as far as sixth. Fans question why the 18-year-old who has been bestowed the expectation-filled (and utterly unfair) nickname “Maple Jordan” hasn’t completely owned the college game. On Monday night, I watched Andrew Wiggins and his No. 8 Jayhawks manhandle a talented Baylor team that’s ranked 24th. Baylor shot better than 50 percent from 3-point range, and KU still won by 10. The win moved Kansas to 5-0 in the Big 12, the toughest conference in the country. In the game, Wiggins drifted at times, like he seemed to do in the Jayhawks’ weekend win over Oklahoma State in which he attempted one shot in the game’s final 29 minutes. He didn’t take the ball and slice through the lane. He didn’t dunk on Cory Jefferson or Isaiah Austin like he had so many 13-year-olds. Without a single highlight clip to his name, he still led his team with 17 points and grabbed seven rebounds. I couldn’t help but leave a bit disappointed. And then slap myself for doing so, because I’ve fallen for that “focus-on-the-NBA-draft” storyline that’s dominated this college basketball season. Look: Andrew Wiggins is an extraordinary talent. He’s also a freshman in college, playing for a team that starts two other freshmen. He’s averaging 15 points and six rebounds for a team that feels like it’s hitting a groove after beating four straight ranked teams — first time that’s happened in 17 years, by the way — to reach 5-0 in conference play. The problem isn’t with Andrew Wiggins. The problem is with us, and with our silly expectations. So after the game I asked Bill Self: Forget the rest of our expectations. How has Wiggins lived up to your expectations? Self thought for a beat, then gave one of the most introspective, thoughtful answers I’ve ever heard at a postgame press conference. He’s so naïve in so many ways. I don’t know if he thinks about that he’s everybody’s Super Bowl when they get a chance to play against him. I don’t know if he feels that. We tell him that, but I don’t know he feels that yet. “It’s just a different world, these kids entering school with all the hype,” Self said. “In a lot of ways he’s handled it beautifully in how he’s deflected it. But I think in some ways he hasn’t understood — or maybe we have not done a good job of explaining to him — that because of the society and the media hype and everything that we live in and the attention that you’re getting, if you don’t produce then you’re going to be the most talked about person. Self is right. Zero chance, from the moment that video was posted on YouTube, that Wiggins could have lived up to the hype. You know what Magic Johnson averaged his freshman year at Michigan State? Seventeen points, eight rebounds. Michael Jordan his freshman year at North Carolina: 13.5 points, 4.4 rebounds. Blake Griffin as an Oklahoma frosh: 14.7 points, 9.1 rebounds. Or how about Vince Carter his freshman year at North Carolina? That feels like the most accurate NBA comparison for Wiggins, at least now. He averaged 15.6 points and 5.1 rebounds, almost a dead ringer for Wiggins’ numbers. Oh, wait — that was Carter’s junior year. The main criticism of Wiggins can be boiled down to this: He is great, but he should be better. His ceiling is so impossibly high, yet he never seems to reach it. “I think he’s done well,” Self said. “I think that there’s another step he can take. He leaves me wanting more. So when people say certain things, I can’t be upset they’re saying them because he leaves me wanting more, too. Self’s main criticism of his phenom? That too often the coach needs to challenge the player at halftime to play more aggressively. Sorry to quote Self so extensively. But what Self was saying gets at the heart of what’s wrong with college basketball in the one-and-done era. Instead of appreciating Andrew Wiggins for what he is — instead of enjoying immensely the act of watching Wiggins and his young team mature before our eyes — we wonder about the next step. We’ve heard about this kid since he was 13; we’ve compared him to Kobe and LeBron and McGrady; then we were somehow disappointed when he didn’t immediately live up to that. It was like we lifted him up in order to cut him down. Here’s what Andrew Wiggins is so far this year: He’s the top scorer and key player on a team that very well could win it all. He’s a kid who we feel needs to show a killer instinct — but who apparently is still fully capable of taking over a game, as he did in the second half of KU’s December loss at Florida. He’s an 18-year-old with nearly the same statistics that Ben McLemore had for Kansas last season, but with a far higher upside. Maybe he’ll become Paul George, as Peter Bukowski of SI.com recently suggested: “a supreme athlete coming out of college at Fresno State, didn’t come into the league with refined offensive skill, but went from a 7.8 point-per-game scorer shooting just 29.7 percent from deep to a 23.8 point-per-game scorer shooting 40.7 percent from deep.” But the George comparison is unfair, too, because the type of hype and expectations Wiggins has already felt will never let him blossom outside the limelight like George has. Wiggins is great, and he’s young, and perhaps surprisingly, he’s not cocky. He won’t become JaMarcus Russell or Ryan Leaf. He might become Bryce Harper, one of the most hyped teenagers of all time, someone whose star was quickly surpassed by his contemporary Mike Trout, but still an All-Star who has the potential to be an all-time great. Wait — there I go again. I’m focusing too much on tomorrow, but today, this Kansas team has a chance to be something special. Don’t you get annoyed when, moments after a team wins a Super Bowl or a World Series or an NBA championship, the star player is asked: Do you think you can repeat next year? So I’m making a resolution regarding Andrew Wiggins, and Jabari Parker, and Aaron Gordon, and Julius Randle, and all the other fabulous freshmen who are making this college basketball season something to behold. I’m no longer going to focus on the worthless perception of movement up or down the NBA draft board. When someone asks me who should be the No. 1 pick in the NBA draft, I’m just going to say there’s a half-dozen who could all be great, if not more, but I’m more interested in how each of them fits into their team at this level. I’m going to focus on today, not tomorrow. Reid Forgrave, senior college basketball writer, has worked for The Des Moines Register, The Cincinnati Enquirer and The Seattle Times. His work has been recognized by Associated Press Sports Editors, the Livingston Awards for Young Journalists and the Society for Features Journalism. Follow him on Twitter.